A warehouse assistant who threatened to carry out a terror attack at Westminster has gone on the run after fleeing court before he could be sentenced. 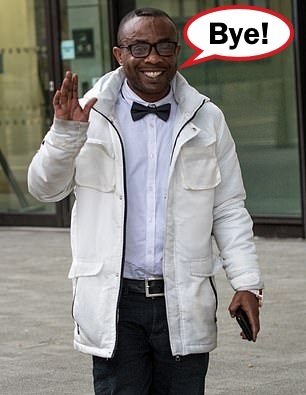 Daniel Osula, 36, was set to find out his punishment today after sending emails to staff at the House of Commons claiming he would stab civil servants and run down pedestrians in the street. A warrant for his arrest has now been issued after he brazenly walked out of a hearing at Westminster Magistrates’ Court this morning.